Development of battery technology is making electric heavy-duty trucks technically and commercially viable and several manufacturers have introduced battery electric trucks recently. However, the national and sectoral differences in freight transport operations affect the viability of electric trucks. 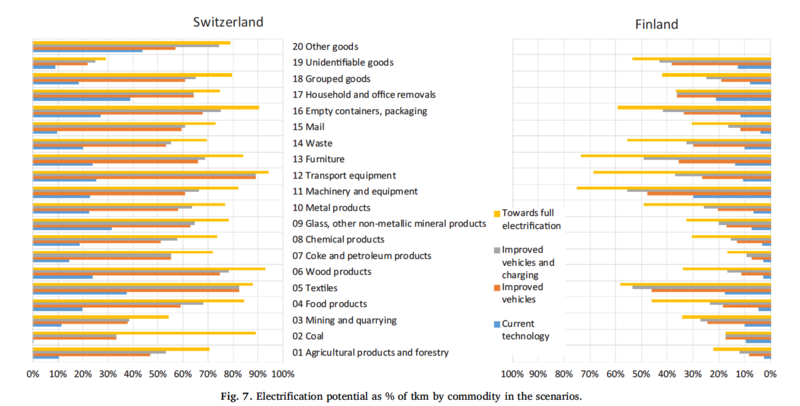 The aim of a new research paper is to develop a methodology for estimating the potential of electric trucks and demonstrate the results in Switzerland and Finland. Analysis of road freight survey data on commodity level was carried out in both countries. As much as 71% of Swiss road freight transport tonne-kilometers may be electrified using battery electric trucks. Finland has very limited potential of 35%, due to the use of long and heavy truck-trailer combinations. Within both countries the electrification potential varies considerably between different commodities, although in Finland more so than in Switzerland. Commodities which are constrained by payload volume rather than weight and are to large extent carried using medium duty or<26t rigid trucks seem to provide high potential for electrification even with the current technology. Electric trucks increase the annual electricity consumption by only 1 to 3%, but truck charging is likely to have a large impact on local grids near logistics centers and rest stations along major roads. A spatial analysis by routing the trips reported in the datasets used in this study should be carried out. Future research should also include a comparison between the alternate ways of electrifying road freight transport, i.e. batteries with charging, batteries with battery swapping and electrified road systems. Liimatainen, H., van Vliet, O., & Aplyn, D. (2019). 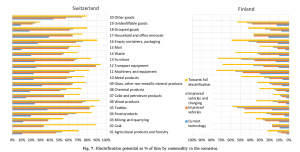 The potential of electric trucks–An international commodity-level analysis. Applied Energy, 236, 804-814.